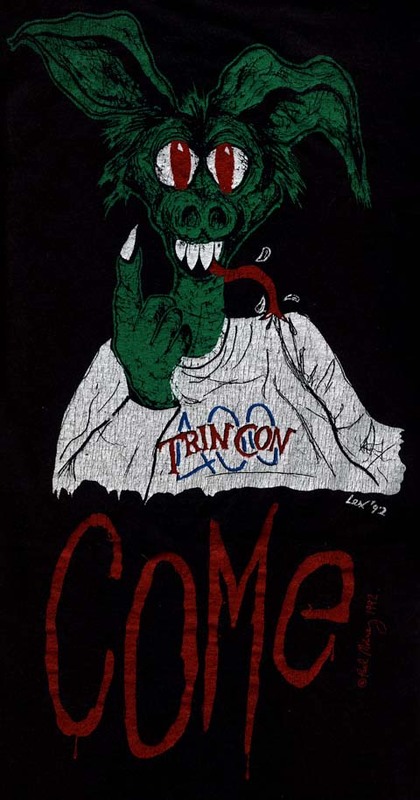 In the process of packing I found an old teeshirt that’s been at the bottom of a drawer for a *very* long time. I think I used to have around 20 of these. For our university’s 400th anniversary, they gave a bunch of us tens of thousands of pounds (pre-Euro!) 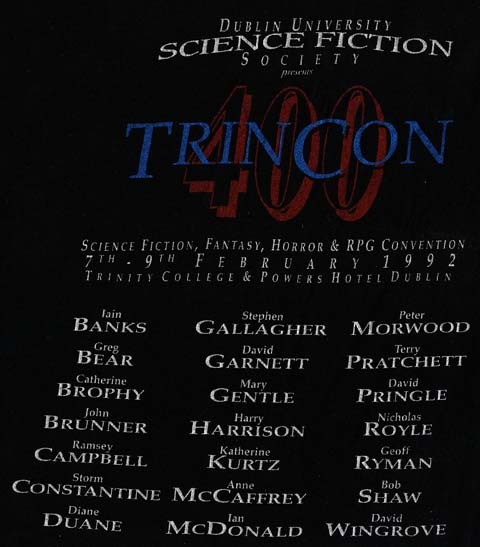 to throw a multi-day Science Fiction party called “TrinCon“. Around that time, amazingly enough, the science fiction society was the largest voluntary (that is, dues-paying) student group on campus with around one-sixth of the undergrads signed up (an accident of history involving limited new movie release availability (which we pwned) and some aggressive marketing). With so much cash thrown at us, we could pretty much afford to encompass all of the genres (we even had a special room set aside for the Trekkies that just looped old Star Trek reruns over and over as a honeypot to keep them safely segregated). Because our college society, the “DUSFS” had been on the campus networks and the Internet since around 1986 or so, we had pretty good emails and connectivity (for 1992!) and handled quite a bit of the correspondence and organising online. We even had ambitions to upload some of the video that was shot but we never did get around to that.